Journalist Billy Jensen has built his career on solving cold case murders, often using information found on social media and in other places the police don't think to look. When detectives have no answers, they call Billy, the world's first digital 'consulting detective.' Step inside the world of true crime as Billy solves the Halloween Mask Murder, finds a murder/fugitive hiding out in Mexico, and investigates the only other murder in New York City on 9/11. Readers will also follow Billy closely as he helps finish Michelle McNamara's #1 New York Times bestseller I'll Be Gone In the Dark, after her sudden death. 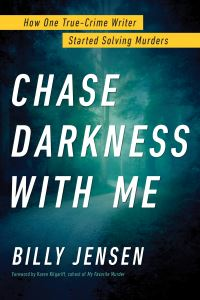 Full of twists, turns, and rabbit holes, Chase Darkness with Me allows readers to ride shotgun with Billy as he uses groundbreaking techniques to identify the criminals behind seemingly unsolvable murders. True crime capers from the journalist turned cold case investigator who helped write the #1 New York Times bestselling true crime story, I'll Be Gone in the Dark.